Today, as the United States celebrates its founding, millions around the world will be talking about its future. Recent revelations about NSA spying have brought unparalleled public attention to the U.S. government's surveillance programs. The dirty details are piling up, and as we learn more about the ways the government has been using the Internet to monitor and track us, people from across the political spectrum are realizing this is a watershed moment for defending our most basic human rights -- privacy, free speech, freedom of association, freedom of the press. Today, tens of thousands of people will protest in the streets at Restore the Fourth rallies organized in over 100 cities across the country, and hundreds of thousands more will protest on the web and TV. 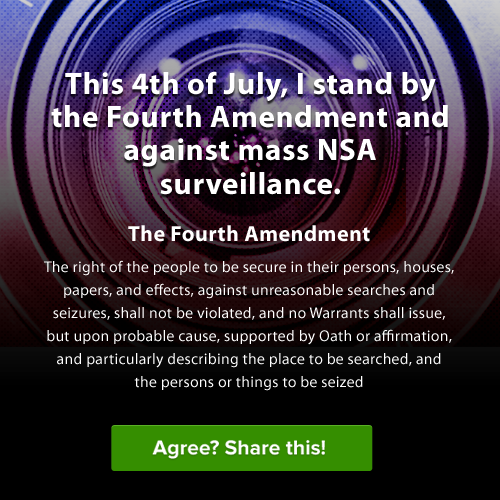 The message is clear: the NSA's mass warrantless surveillance programs violate the 4th Amendment. If you hated history class, that's the one that protects you from "unreasonable search and seizure" by the government. It's important to note that the U.S. government's dragnet system violates international law too, including Article 12 of the Universal Declaration of Human Rights. To amplify the street protests, the Internet Defense League, which is the formidable network of websites that emerged victorious from the now-infamous SOPA blackout, has raised the "Cat Signal" -- its warning beacon for the Internet. 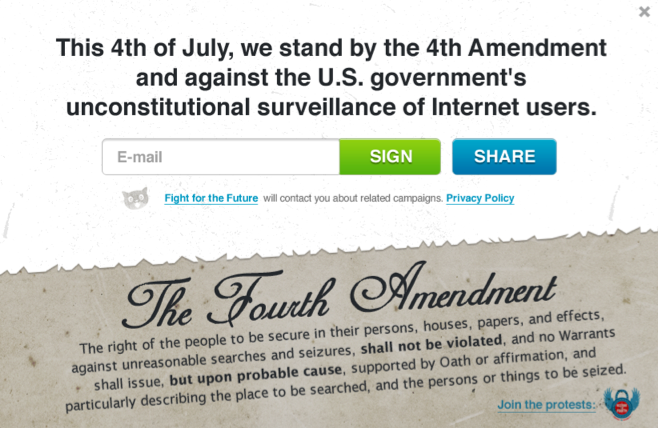 Thousands of websites, celebrities, and organizations will be posting the 4th Amendment on the web, including some of the biggest names on the web: WordPress (which serves up 18% of all websites), 4chan, Imgur, Reddit, Mozilla, Internet Association, Fark, TOR Project, Cheezburger, Namecheap, O'Reilly Media, MoveOn, Avaaz, Upworthy, ACLU, and EFF. The text of the 4th Amendment will make an appearance on television throughout the holiday weekend too. The Internet is helping to fund a TV ad that will appear in the states where there are Senate and House Intelligence Committee members with financial ties to the NSA programs. Today's protests are a turning point for opposing mass government surveillance. They are the beginning of a large outcry that will continue until we hear real answers and real accountability. We liken today to the first protests that got us to the SOPA blackout and ultimately, the shelving of SOPA and PIPA; American Censorship Day took place 2 months before the blackout and was responsible for making SOPA a household term. It took a lot to defeat SOPA, but it was just one law. What we're fighting today is something much bigger and more insidious. We're fighting a broken government that has systematically violated our rights, and turned the Internet into something it was never intended to be -- a surveillance network for the government to observe the private lives of anyone in the world. While the documents that whistle-blower Edward Snowden has revealed are shocking, for many they only confirm what rights groups have been saying for decades. We've known about some of these NSA programs for years, and even before the NSA's existence, the FBI and other government agencies conducted COINTELPRO and other operations to stifle legitimate political dissent. Martin Luther King and Nelson Mandela were targets -- every marginalized group has experienced this kind of repression. Given that the U.S. also incarcerates more people than any other country in the world, it's no surprise that so many are questioning the motives behind government invasions of privacy. Data is power. The government has stolen and can now analyze billions of data to know everything about you -- they're painting a picture of what you do, what you buy, who you call, where you go. This isn't just about the pizza delivery you called for. It's not just harmless meta data, as some characterize it. Government agents can use this info to infer whether you have an illness or an addiction, eye your money troubles, or gather what your religious affiliations and political activities are. They can investigate anyone for exercising their First Amendment right, and target people based on the books they read and the websites they visit. Data aggregation and pattern analysis give the government power over everyone's lives. What happens to free speech, free association, or a free press when everyone is always being watched, even in their most private moments? At least 850,000 people have security clearances that give them access to this information. That's the size of Boston. Imagine if they leak information about a politician or business leaders' personal life -- what about a prominent activist? The opportunities for abuse and blackmail are endless; despite what some members of Congress have claimed, the history of government surveillance programs is riddled with abuses. Recently, 18 year old Cameron D'Ambrosio went to jail for over a month for just referencing the Boston Bombings in a rap song that he posted to his Facebook page. Ernest Hemingway killed himself after FBI surveillance made him feel isolated and inhibited. We know all too closely how surveillance isolated our friend and Internet activist Aaron Swartz, who killed himself earlier this year under the FBI's extended wiretapping. America's founders *hated* oppressive British surveillance. 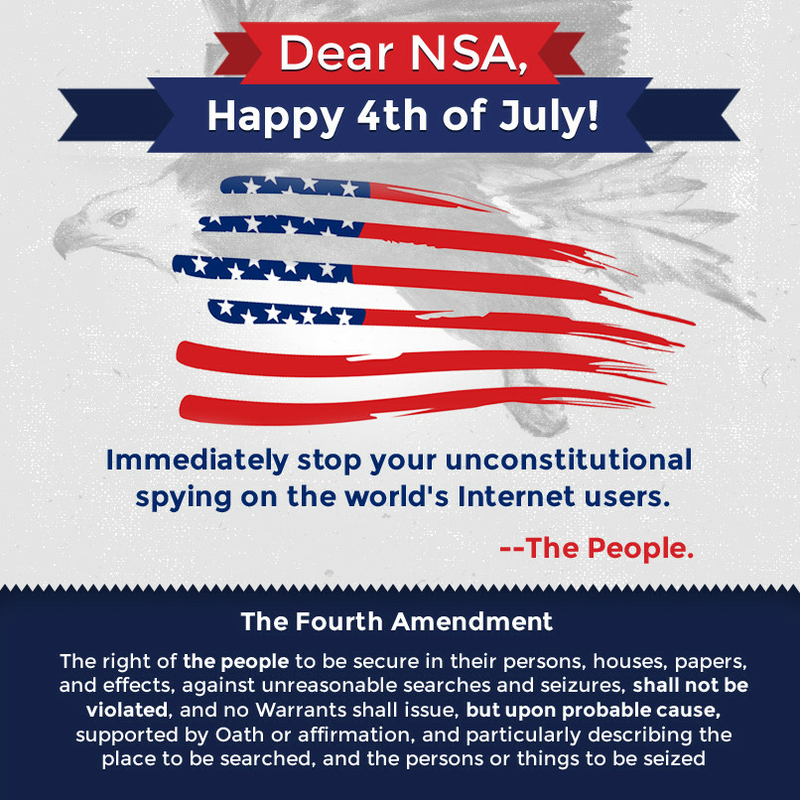 Understanding that privacy was necessary to many of the basic rights granted to us in the Constitution, they established the 4th Amendment. But Snowden's revelations show another America: a spy state that intercepts the emails and phone calls of innocent people. What the NSA is doing is criminal. It's immoral. And it goes against everything this country is supposed to be about. Scholars of privacy and experts on intelligence and surveillance agree. That's why we're taking over the streets, the internet, and the airwaves today, and that's evidence that the people's passion for the 4th Amendment is still alive and well. Those responsible for this illegal and anti-democratic surveillance will have to answer to the public one way or another. Here's a few images to share for the Fourth!